I came across an amazing graphic today and just had to share it with you. I’d love to hear what you all think this means, if anything at all. 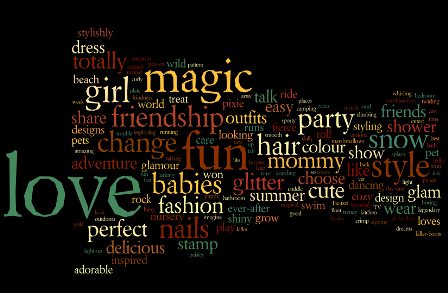 These graphics are word clouds created by the website achilleseffect.com exploring key words used in advertisement of toys for boys and girls. My concern is what messages are our kids receiving as a result of marketing such as this? We’d love to hear your thoughts on this. How do you think this type of marketing is impacting our kids? Thanks for your comment Lily. 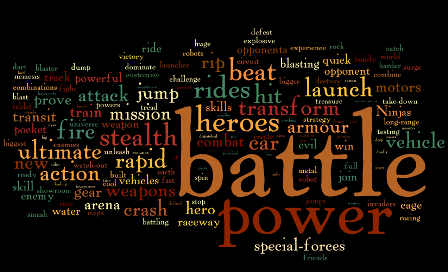 As a father of 4 (3 girls) these graphics just blew me away. I’ve been reading Cinderella Ate My Daughter by Peggy Orenstein. She explores the impact of marketing techniques such as these in greater detail. It’s a great but challenging read. I think it’s telling that you did not even have to say which one was geared toward boys and which was geared toward girls. I am about 99% in support of socialization over genetics when it comes to gender differences. However, my girlfriend (I am also a girl) is very “masculine,” and she was always attracted to soldiers and guns, whereas I am more “feminine” and have always been into baby dolls and caretaking games. Both our parents claim to have raised us with gender neutral toys as well as toys marketed for both boys and girls, and both claim that we were that way before we entered school/watched tv. This is interesting to me only because I know and believe that gender is socialized. But to answer your question, I think it is horrifying how these ideas are marketed to our youth! And it would be less an issue if we were engaging them in some meaningful critique about it, but most schools don’t provide that type of conversation.